Amy van Keeken is a self-proclaimed radio nerd. Her love of the medium kicked off when she was just a kid, listening in on her dad’s 70s stereo receiver. In her 20s, she travelled down the west coast of the United States. “I’d spend hours in my hostel bed at night, tuning in on my off-brand walkman to the incredible variety of stations in California and into Mexico,” she says. At home in Edmonton, she'd record CKUA and CBC shows, replaying them to soak up musical knowledge. 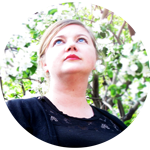 Amy got her official start in radio at CJSR, Edmonton's campus-based community radio station, co-hosting an award-winning weekly show Twang n Thangs for six years. She joined the CKUA gang in 2015. Beyond her radio hosting skills, Amy is an admired musician/singer/songwriter. Acclaimed for her solo work, she has also graced many stages with musician buddies. These include the rock group The Secretaries and folk-roots band The AwesomeHots. Her current side project is Mysticeti, an experimental rock duo with Dara Humniski. She’s opened for The Highest Order, Kacy & Clayton and Melissa Etheridge at Edmonton’s Winspear Centre. As you may have guessed, it’s impossible to pin Amy down to one style of music. The vinyl collector says she loves exploring the ways songs connect -- beyond genre, decade, feeling and style. Anyone who hears her shows will understand that "it's all about the song, no matter what genre." Amy released her latest full-length album In Dreams in 2018. “Amy van Keeken continues to thrive on her intuitive musicality with her latest offering of dreamy golden-hour pop," stated a review in Beatroute Magazine, praising her "clear and sophisticated vocal style." Her 2016 record, All the Time, earned her two Edmonton Music Awards nominations. Amy is also an inclusive all-abilities voice teacher and performance coach.